Godric Bader and the Scott Bader Commonwealth were jointly awarded the Gandhi Foundation’s Peace Award in recognition of their alternative business model. 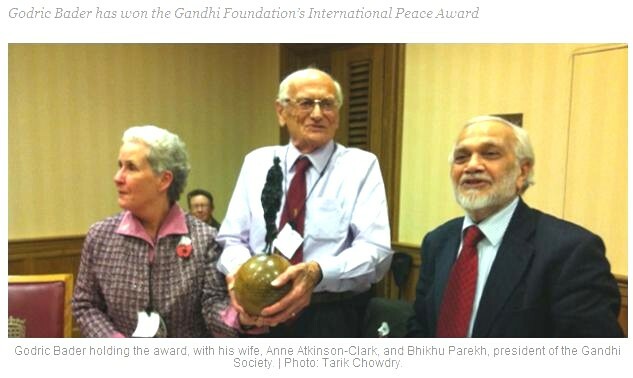 An attender wrote: “The House of Lords event was marvellous – packed to the rafters (apparently the largest turnout they’ve ever had for the Gandhi Foundation Peace Award). Godric delivered an excellent speech and there was a tangible buzz in the room during the Q and A session”. Scott Bader was founded in 1921 and conventionally managed for thirty years. However the founder Ernest Bader and his family believed that ethical and moral action to improve this world was vital. They believed that labour should employ capital, acknowledging everyone as equals; in 1951 they transferred personal shares in their chemical company to their employees, making them ‘trustees in common’ and the Scott Bader Commonwealth was founded. See: www.scottbader.com/about-us/11/our-history, scroll down for video. leading by example and resolving conflicts non-violently through dialogue. The Commonwealth was conceived “as an alternative to a war-based capitalist economy on the one hand and to communism on the other”. In addition to other sponsorships (see website), the company’s constitution requires it to donate a minimum of 1% of the group salary bill to the Commonwealth Global Charity Fund each year. £176,000 was donated in 2013 from 2012 group profits. As Scott Bader has no external shareholders it cannot be taken over, so there is stability and long-term planning. As trustees-in-common, employees have the responsibility of ownership which creates greater commitment and engagement to ensure ongoing success, and drives active involvement. This entry was posted in Democratic participation and tagged alternative business model, Ernest Bader, Gandhi Foundation’s Peace Award, Godric Bader, Scott Bader Commonwealth. Bookmark the permalink.